FROM STANDARD TO BESPOKE, ALL ROPEBLOCK PRODUCTS COME WITH VAST EXPERIENCE INCLUDED. SMART ENGINEERING WILL GIVE YOU A HEAD START BY PROVIDING EXCELLENT PERFORMANCE AT PERFECT RATES. THOROUGH KNOWLEDGE OF MARKETS ALLOWS US TO COME UP WITH PRODUCTS THAT DELIVER. Ropeblock hardware is found worldwide wherever key components in crane systems are in contact with the wire rope. Our products are designed to contribute to consistent safety and efficiency in any type of lifting & rigging application. 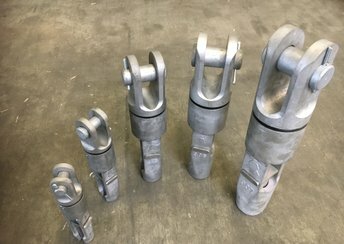 We have extensive knowledge of blocks, sockets, and rigging gear, with unique value being added by our Smart Engineering approach. This combination is our key to providing solutions that deliver. We manufacture and globally distribute thousands of blocks and tens of thousands of sheaves and sockets a year. In addition we offer smart warehousing and logistics services. In today’s world being efficient is about more than just getting the job done. It’s also about spending money wisely in order to remain competitive. Smart Engineering by Ropeblock will help you to get the best of both worlds. That’s true efficiency for you. Ropeblock is a globally renowned manufacturer of lifting & rigging hardware. Besides Smart Engineered products and solutions, our reputation is due to thorough knowledge of the markets in which we operate. Our market specialists speak your language. Whenever necessary they will come up with customized products that seamlessly fit into your application. Of course Ropeblock also has an extensive range of standard products, all offered with any required certification. In response to market requests Ropeblock developed a socket with an integral swivel. This latest example of Smart Engineering features a shorter overall length than the conventional combination of a loose swivel and socket. Furthermore, our integrated solution delivers an outstanding efficiency of 100%. Sales Engineer Twan Stevelink was one of the originators of the initial idea and concept for the Ropeblock Super reeve Connector Swivel Socket (SCS-SW). Read his story about the creation of this smart new product and the practical user benefits it has in store. 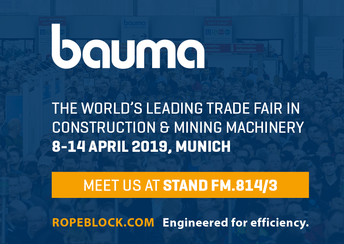 Ropeblock will be one of the exhibitors at the 2019 edition of BAUMA 2019 (stand FM.814/3). The exhibition will take place on 8-14 April 2019 in Munich, Germany. We hope to see you there! 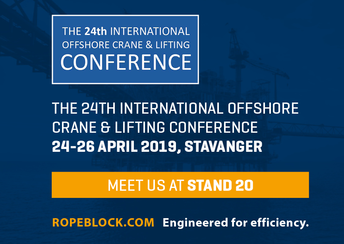 Ropeblock looks forward to meeting you at “The 24th International Offshore Crane and Lifting Conference”.